Household mold is an all too common scourge that reportedly afflicts fully 100 percent of the houses in the United States today. The prime causes of mold are not a secret. Mold spores become airborne and easily get into a house. A combination of moisture, oxygen, warmth, darkness, and something for them to feed on is necessary for mold to flourish, spread, and multiply. Mold needs 24-48 hours in these optimal conditions for it to grow and appear. What are the Most Common Types of Mold? This toxic mold begins as a moist, small mold that becomes powdery and grey, pink, white, or orange colored. It grows within home systems such as drain pans, cooling coils, humidifiers, and window sealants. The risks from acremonium are perilous, and can cause immune system diseases and bone marrow diseases. It can even also impede proper brain function. An allergy causing mold that makes thick layers of it. The risks may be minor, though there can also be serious reactions including inflamed lungs and respiratory infections. It can cause a killing carcinogen known as aflatoxins to appear. This allergenic mold is velvety in appearance with brown or dark green hairs. It appears in bathtubs, showers, and under sinks. Generally warning of water damage, such mold spreads rapidly and causes asthma symptoms as well as hives and watery, itchy eyes. An allergenic mold, it is typically black, brown, or pink, turning a darker brown as it ages. This mold is commonly found on wooden or painted surfaces or behind wallpaper. Prolonged exposure leads to nail, skin, and eye infections. An allergenic mold, this has been called brown or olive green colored mold that bears a suede type of texture. You find it commonly on fabrics, carpet, wooden floors, upholstery, and cabinets. It causes respiratory problems and other breathing issues if left untreated. A cotton-like looking texture of mold that starts life out in white, this mold is known to darken over time, eventually becoming from brown to black colored. Water damaged buildings and roofs, pipes, drywall, and basements are favorite homes for this mold. It gives off a musty smell and causes nail and skin infections. This mold is both allergenic causing and toxigenic. It can be red, pink, or white. You find Fusarium in wallpaper, carpets, and fabrics. It grows and spreads quickly on foods. The risks from its presence are many, including allergenic reactions and skin infections. Prolonged exposure leads to dangerous conditions such as brain abscess and bone infections. The toxins can even afflict the nervous system and cause both internal bleeding and possibly hemorrhaging. 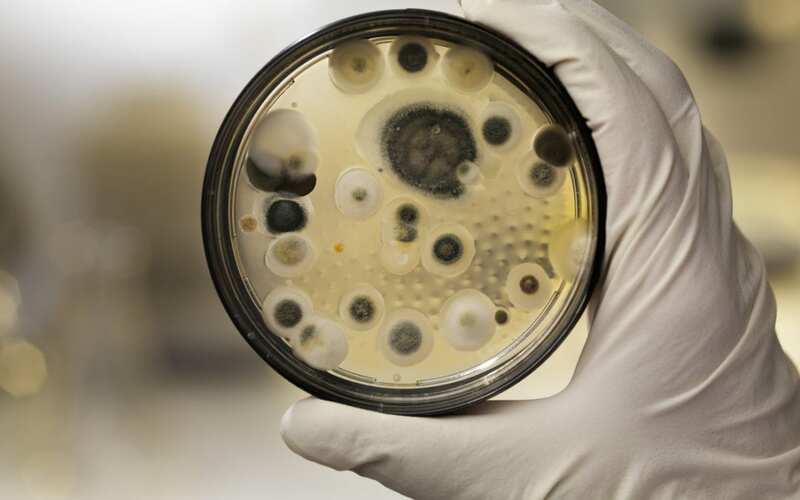 The basis of all antibiotics is also an allergenic mold. It looks green or blue and velvet like. You find this dangerous form of Penicilin in water-damaged structures including wallpaper, ducts, mattresses, and carpets. It spreads rapidly if not treated quickly. The fast traveling spores lead to respiratory issues, asthma, chronic sinusitis, and pulmonary inflammation. This allergenic mold is gray or white, and it thickly and quickly grows and spreads. It lives near HVAC ducts, A/C units, and damp carpets afflicted by condensation. It causes flu types of symptoms and asthma, and can also lead to a fungus infection with potential to damage nose, eyes, lungs, sinuses, and even your brain. The toxigenic mold is slimy black or dark green. It thrives in places that are humid, wet, and damp over weeks, and especially in wicker, cardboard, and wood. Your risks from Stachybotrys include serious health complications. These include fatigue, breathing, sinusitis, and even depression. There can also be pulmonary bleeding and neurological issues in infants and children exposed to it. Allergenic mold that appears in green or white wool looking patches, there are five different sub-species of this mold. It thrives in wet wallpaper, fabrics, carpets, and moister areas like A/C filters and ducts. The risks are many but mostly non-pathogenic. They can include production of mycotoxins causing allergic reactions, sinusitis, and other related health issues. A black mold, it is commonly found in bathrooms, kitchens, windows, and basements, all heavily water damaged or thoroughly affected by condensation. The risks include skin infections, hay fever, problems breathing, and asthma-like symptoms. Mold comes from everywhere unfortunately. It can grow in any element if it has the key necessary moisture. Mold reproduces easily in spores that are easily airborne by air currents such as those common to air conditioning. When the mold spores find a wet surface that is suitable to live on, they start growing straight away and often spread rapidly. How Can You Prevent Mold? Preventing mold is a matter of controlling moisture in a home or area. This means that you must find moisture problem areas and address them quickly. Wet places need to be dried straight away. Sufficient ventilation will help to keep excessive moisture down. You can also seek out mold-resistant products with which to furnish your house. You can install a dehumidifier to control humidity levels inside. Direct water out of and away from your house by keeping roof gutters cleaned and repaired. What Can You Do if You Have Mold? The best thing to do if you find a dangerous level of mold in your home is to call a professional. Professional mold removal is complicated for several reasons. Mold is very difficult to identify and even more perilous to be near for extended periods of time. Professional mold removal people will utilize mold remediation equipment specifically designed for removing mold entirely so that the problem does not come back in the house in the future. For homes that suffer from a particularly chronic instance of mold infestation, professionals will be required to address the problems. The house will have experienced a significant level of damage from it, so that a professional will have to eliminate all mold before the home can be properly restored. This is necessary for safety for your family, to protect them from the likely dangerous effects of infections and allergies that mold brings. In cases where mold infestations are major in scale, an entire mold remediation team will likely be called in to handle the problem. They will utilize commercial equipment to dry out all impacted areas and employ commercial strength dehumidfiers and air movers and scrubbers to dry all surfaces and air, eliminating moisture in the process. To stop the mold spores from becoming airborne, they will seal off every impacted location before working. They will plastic sheet off all vents and doorways. Sometimes they will even establish negative air pressure with an air mover to keep all air currents going out.The effects of negative air pressure are to stop the spread of mold spores from getting into the other parts of a house. A professional mold remediation company may also rely on fungicide to make certain that all of the mold spores have been removed. These products will also keep the infestation from returning. All non-removable materials that have porous surfaces will have this fungicide applied to cover them.